In ROSIE, award-winning Irish novelist Roddy Doyle brings his signature brand of warmth and authenticity to a modern story of a Dublin family who has found themselves with nowhere left to go. Hailed as the most important Irish film of the year, ROSIE follows a young mother as she searches to find a room for the night for her family – a tense race against time as the hours count down and their options run out. 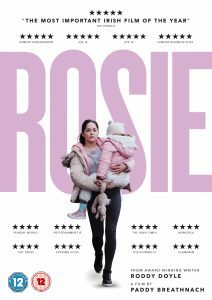 ROSIE is available digitally from a range of platforms, including iTunes, Virgin Media, SKY, Amazon, Google Play, BFI Player and Volta. Irish DVD stockists include Tesco, Supervalu, Tower Records, Golden Discs, Amazon, Easons, and HMV and FOPP stores in the UK.